Hong Kong's best juice detoxes, offering cold pressed juices, super food smoothies, detoxes, and deep cleanses. Anyone trying to kick-start a diet, change in lifestyle or add a fitness program will immediately consider juice detoxes or cleanses as the way to go. Fortunately, Hong Kong has a fantastic selection of cleanse programs and juice shops ready to help you get healthy. Pick a pre-designed detox program (many of which can be ordered online), select juices yourself to create a custom cleanse or simply choose a few single servings of something yummy to supplement healthy eating. But before we get to that – why juice? The answer to that question depends on your goals. Juicing is a great way to get a fast shot of nature’s vitamins and minerals on the go, but depending on the ingredients there are some juices that are better than others. Fruit based juices are high in sugar and can give you the same highs and lows as consuming high carbohydrate foods. However, down a green juice or smoothie and you are getting a vitamin packed punch of nutrients including vitamin C, calcium, phytonutrients and micronutrients. Add a bit of coconut oil or avocado and you have a full meal. Juicing is a great way to complement healthy meals or remind yourself after the holidays what it’s like to eat clean. See what the buzz around detoxing and juicing is all about before taking the plunge into your juice-feast with our top picks. The Hong Kong Juice Company started two years ago by juicing solely for cancer patients. This crème de la crème of juicing companies only uses 100% certified organic (USDA/JAS/EU) ingredients in all the juices and they have a range of products and cleanses to offer. All the individual organic certifications are available. They even have a resident nutritionist. When you receive delivery of this juice, you will see it is packed with nutrients, as the juices are opaque, dense and satisfying. Juice detoxes are available at three different levels from beginner to ‘Very Green’. Opting for the Level 3 will get you a consultation over the phone with the full-time nutritionist and customised juices to fit your goals. Choose from a 3-day, 5-day or customised cleanse starting at $750. Fresh-pressed juices are bottled locally and delivered directly to your door the night before you begin your cleanse. Be-Juiced cleanse programs are available at three levels – Reboot, Grounding, or total Vegification, with increasing greens and decreasing amounts of sugar/fruit included in the juice blends chosen for each level. A bit bummed about giving up food for a few days? Tongue-in-cheek drink names like Dr. Bunny, Beet It, and Oh My Gazpacho are sure to make you smile. Choose a one, three, or six day program; groups of five or more detoxing together can receive a 10% discount. A 3 day cleanse is $1580 and 6 day cleanse is $3160. Prefer to drink rather than eat your superfoods? Look no further than Pure Swell. Their line of natural juices each have a special purpose – Hydrate, Immunity, Detox, Pick Me Up, Refuel, and Nut Mylk, featuring healthy and delicious ingredients like sprouted almonds, maca, spirulina, and tumeric blended with yummy tastes like coconut, mango, ginger, and vanilla. 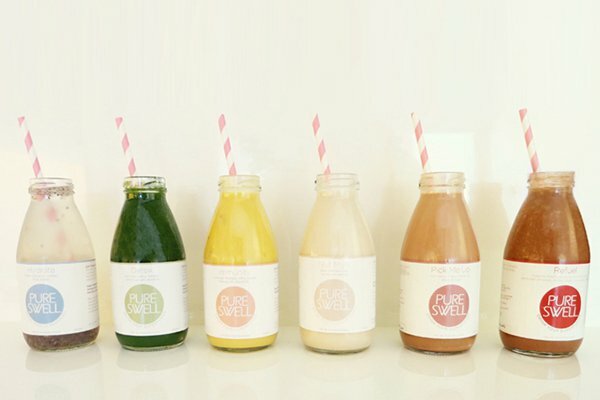 All Pure Swell beverages are soy, dairy, and gluten free; unpasteurized, and served in glass bottles (so no need to worry about toxins in plastic). Available to order on their website or from Eat FRESH veggie delivery. Healthy meets delicious at this juice bar and cafe in the form of cold pressed juices, superfood smoothies, and raw food snacks. Raw food treats on offer include soups, organic coffee (topped with raw vegan chocolate syrup), and lemon macaroons sweetened with coconut flour rather than sugar. Yum! Looking to do a complete detox or deep cleanse? Nood Food can help you by providing everything you need for a full three or six day juice program. Genie Juicery was designed to help busy city-dwellers keep fit and healthy with no added fuss. Full juice cleanse programs (designed for beginner, intermediate, and expert detoxers) lasting as few as one day right up to a six day long super cleanse include fruitier concoctions for beginners (like Beaches, featuring strawberry, pineapple, mint, and acai) and and more intense blends such as the Sawadekah (Kale, Spinach, Cucumber, Pineapple, Coriander, Lemongrass, Lime) for the experts. Raw, organic food is also available at their ifc store (shop 2096B). Menu items include things like nori crackers, flax snax, popcorn and coconut macaroons! A 3 day cleanse is $1600 and a 6 day cleanse is $3200. Mr Green Juice offers three, four and five day juice cleanse programmes to help you jump-start your body for a more active life, healthier life. You will drink a whole lot of juice to give your body the break it needs and it’s a great way to recharge, rejuvenate, and renew. The juices are organic cold-pressed with no water or no additives. Mr Green Juice recipes will make you feel good, stay skinny, glow, boost your immune system, and of course detoxify! They also offer a range of nut milks and immunity boosting juices that can be bought individually at IPC Foodlab on Caine Road, or order a minimum of three via the website and have them delivered to your door. The three day Punch Detox is the perfect way to kick start the system and help set up a healthy and clean eating lifestyle. The plan will ensure you load your body up with nutrients, while flushing out toxins to leave you feeling lighter, less sluggish and full of energy. Once you’ve ordered your juices, they will be delivered to your door the day before you start your cleanse. The delicious flavours include Citrus Punch which contains lemon, cayenne pepper, agave nectar and ginger or the Green Punch which has celery, kale, parsley, cucumber, bitter lemon and spirulina. A 3 day cleanse is $1680 and discounts are available for bulk orders. Options are the name of the game at Pressed Juices, and here you have the choice of walking in to the store or getting delivery of your favourite juices from their website. Kids will love the fresh fruit juices including the Berry Glow range in numbers 1, 2 and 3. Meal replacement juices are available, as well. Detoxes start with the Basic (more fruit based juices) and go on to the Master Cleanse (more vegetable-based) depending on your experiences with juice detoxes. There are loads of options in-store, so go check them out and decide what you prefer before delving into a cleanse. 1 to 7 day cleanses are available starting at $500 and going up to $2,800. > Healthy Living in HK on The HK HUB!